Tim Boyd, president and CEO of Save Electronics in Richardson, Texas; Bruce Kaufmann, president and CEO of Gaithersburg, Md.-based Human Circuit; and Jay McArdle, CIO of ZDI in Normal, Ill., discuss IoT at 2017 CI Summit in Orlando, Fla.
“This is nothing new, guys.” Whenever you try to talk to technology professionals about an emerging technology, you usually learn that it’s not as new or emerging as you think it is. Such was the case when talking to a panel of integrators about Internet of Things (IoT) at CI Summit, part of Total Tech Summit, in Orlando, Fla., in November. IoT is a “bunch of sensors in an environment connected to a network,” summed up Jay McArdle, CIO of ZDI in Normal, Ill. So, yeah. 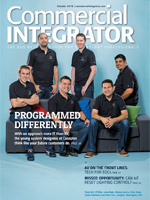 For integrators, it’s nothing new. Related: Do Standardized, Repeatable Meeting Room Solutions Make Sense for You? 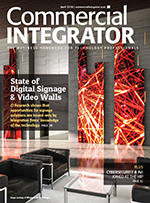 In essence, AV integrators have been dealing with sensors and connected networks for quite some time. “We’ve been talking to motion sensors and making something happen. We’ve been having a button press do something else,” McArdle said. 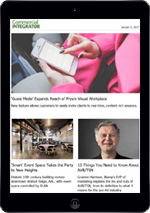 However, IoT has become one of the buzziest terms in technology, let alone the AV integration market, and for good reason, said panelist Tim Boyd, president and CEO of Save Electronics in Richardson, Texas. He sees excitement about IoT in both the residential and commercial markets since his firm serves both. Kaufmann and McArdle, meanwhile, each presented IoT as not so much an opportunity for AV integration firms but as a trigger to elevate their services – and, to a certain degree, a transition from traditional offerings. IoT Should Be AV Integrators’ Domain … But Is It? AV integrators have been in the “if this, then that” business for the past two to three decades, McArdle says. IoT is in every environment and the AV integration firm is the master of the technology environment,” he said. It’s not so much that integrators should be excited about the proliferation of IoT, Kaufmann said. Instead, he suggested a healthy amount of paranoia. A big impact of IoT, Kaufmann contended, is how artificial intelligence will change expectations when it comes to automation. “There’s going to be something like 50 billion [IoT] devices by 2020. It’s just more in-bred to the products now,” he said, citing Google Home and Amazon Alexa. It’s already happening and “all the ’trons and AMX” should take note, he said. “It’s not about the proprietary hardware anymore.” Now, he says very smart devices are already hooked up to the network. They already have diagnostics. Then there are the IoT related security and privacy issues which are legit. The fact that those now-smarter devices are hooked up to networks and have built-in diagnostics creates security concerns, Kaufmann said. With 50 billion of those devices, he expressed security concerns about what is being monitored and how it’s being monitored. “I live in a very paranoid society of Washington, D.C., and we have a huge number of customers that cant’ have that constant connectivity. It doesn’t happen,” he said, citing federal government clients. One integrator in the audience, Conference Technologies chief technology officer Eric Snider, challenged the panel on their IoT positions. “I’m actually seeing a reverse in the industry from the corporate 100,” he said. “We have to be better as an industry. Network security is something that needs to be taken seriously and understood,” says Zdi’s Jay McArdle. McArdle acknowledged those obstacles, but repackaged them as a challenge for the AV integrators. “We have to be better as an industry. Network security is something that needs to be taken seriously and understood,” he said.